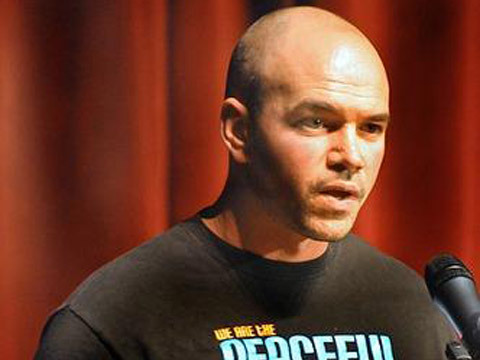 On December 19th, 2008, Tim DeChristopher, known as Bidder #70, derailed the Bush Administration’s last minute, widely disputed federal BLM Oil and Gas lease auction, effectively safeguarding thousands of acres of pristine Utah land surrounding Arches National Park, Canyonlands National Park and Dinosaur National Monument. Bidding $1.7 million, Tim won 22,000 acres of land with no intention to pay or drill. DeChristopher’s disruption of the auction bought enough time for the incoming Obama Administration and Interior Secretary Salazar to invalidate the auction, citing inadequate analysis of the environmental effects on surrounding areas and failure to assess contributions to global climate change. For his disruption of the illegitimate auction, DeChristopher was indicted and convicted on two federal charges and faces a possible ten years in prison and fines of $750,000. Tim’s profoundly effective act of civil disobedience has drawn national attention to America’s energy policy and criticism to the BLM’s management of public lands. Refusing to compromise his principles and rejecting numerous plea offers by the prosecution, Tim is willing to sacrifice his own future to bring this vitally important issue to our national attention. Bidder 70 is a personal story surrounded by a wider context of citizen action, our American tradition of peaceful civil disobedience, and grass roots movements demanding government and industry accountability. Beth and George Gage, as Gage & Gage Productions, have created award-winning documentaries since 1993. In a complete “about-face,” they turned from careers producing and directing TV commercials and fictional features in Los Angeles to producing documentaries with a conscience in Telluride, Colorado. Gage & Gage Productions creates compelling personal films that will empower viewers, initiate dialogue and prompt action on provocative issues. Concentrating on the environment and social justice, they present issues underrepresented in the current media. Their films educate, entertain, inspire and motivate viewers to become actively involved in humanitarian and environmental issues. Gage & Gage Productions has completed seven feature length documentaries. The films have won dozens of awards at national and international film festivals and have been highly acclaimed by film reviewers.